How Do You Write a Magnetic Author Bio? You landed a guest post on a very popular website. You don’t want to screw this up, so you take the next week to fine tune your piece. You research extensively, make sure to link back to other popular posts on the blog and spend hours crafting the perfect headline. When everything is edited and proofread for the final time, you slap on your author bio and submit your piece. Your author bio is your ticket to landing solid writing gigs. 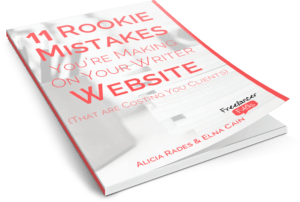 Well, if you’re a new freelance writer and haven’t landed a client yet, guest posting – and more importantly, your author bio – is your ticket to landing solid writing gigs. Some freelance writers say they would never give away their writing for free. After all, this is exactly what guest posting is – giving away your best content to another blog. But, this is furthest from the truth. In return for your writing, you are given a hot piece of real estate – an author bio at the end of your guest post. While you might think you’re attracting clients with your content, the real magic happens when they read your author bio. When you’re new to freelance writing, the last thing you think about is your author bio. Of course, your primary goal is to land clients and start getting paid to write. So, you spend less time guest posting, fine-tuning your writer website and establishing a presence on social media. What ends up happening? Because you didn’t put the effort into your brand, when you do end up guest posting, your author bio says nothing about what you do and has links to nowhere. To attract your ideal client ­– or any client at the moment – your author bio has to attract, wow and convince prospects that you are the one they want. When you have a magnetic author bio, you stand out, creating an opportunity to be seen and be hired. A great author bio has four key elements of attracting prospective clients back to your writer website. See, your author bio is what will convince a prospect to seek out more information about you. If you provide a link to your site or portfolio – which you should always – it’s super easy for someone to click and immediately learn more about what you offer. Spend the time writing a solid author bio. You won’t regret it. Let’s look closely at these four key elements to crafting an incredible author bio. I’ve come across many author bios from budding freelance writers, and after reading them, I am not sure they are even a freelance writer looking for work. Your author bio isn’t going to help you land clients if you don’t link back to your writer website or Hire Me page. If you don’t have a writer website, you can always link to your portfolio and email address. Don’t feel pressured to have a writer website fully functioning before you guest post. You can quickly put something together or use your personal blog and add a page or two. Clients need to find more about you, and providing links to your portfolio will allow them to see what types of writing you do, or linking to your Hire Me page can show them the type of services you offer. A way to stand out from other freelance writers is to mention something significant in your author bio. Find ways to distinguish yourself from other freelance writers. These accolades can help sway a prospective client to hire you over another writer. Finally, your author bio should hint at a sign of your personality. Showing who you are makes your bio memorable. Sometimes your headshot is enough to showcase your personality. But, you can also inject some fun in your bio. For example, I often include the line, when I’m not writing, you can find me at mom and tot groups dishing my latest parent fail. This tells clients I have a life outside of writing, something that may be important for clients. Find something that screams you and include it in your author bio. Enough about what your author bio lacks; let’s start looking at examples of what author bios should be. Henneke Duistermaat is an irreverent copywriter and marketer. She’s on a mission to stamp out gobbledygook and to make boring business blogs sparkle. Get her free 16-Part Snackable Writing Course for Busy People and learn how to enchant your readers and win more business. Notice her choice of words – stamp, gobbledygook, sparkle – evoke an emotional quality to her bio. You know if you hire her, she’ll inject some of her personality into her copy. Keri is clear on the type of client she seeks (small businesses and startups) and she gives us a taste of who she is (a lover of all things geeky). Our last example comes from Pooja Lohana. Pooja has been featured on Firepole, JeffBullas, MarketingProfs, Hongkiat and more. She is an accomplished freelance writer, pro blogger, ghost writer and editor. Talk to her if you want to simplify content marketing, make more sales and live the Un-9-5 life. Pooja’s bio is pretty impressive I think. You can tell she’s worked hard in this industry to get to where she is. Her choice of words – accomplished and pro – signify her level of success. If your guest posts aren’t bringing you clients, maybe it’s time to see if your author bio is to blame. Take some time and review your bio and see how you can improve it. In the long run, the time you spend crafting a magnetic bio will earn you more work and ultimately better paying gigs. Is your author bio doing all that it can do for you? If not, maybe it’s time to change it. Let us know in the comments. How Do I Promote Myself as a Freelance Writer? I actually have the hardest time writing my own bios. It’s always so much easier writing for other people, right? It seems like every few months I suddenly realize my bio is terrible and I got it all wrong, and I have to change it immediately, haha. I try to note whenever I find bios that really interest me, and analyze exactly what it is about them I like. I think adding a bit of quirkiness & personality is really important to set you apart and make you memorable. I actually liked your bio. I used yours to help write mine when Adam hired me over on Blogging Wizard. It was a great reference point. It’s good though, to take a look at your bio and update it to reflect where you are right now. I look back to older author bios and can’t believe I wrote that! Ha..We are our worst critic. I agree with the bit of quirkiness to your bio. Sometimes I feel I don’t want to be “too out there” and then the client thinks I’m weird! ha.. Thank you so much for adding my BIO as an example 🙂 Appreciate it. And isn’t Adam amazing? I’m sure you’re having a blast working with him! No problem. I like reading other writers’ author bios and yours is great! And yes, Adam is an ideal client for sure! Okay….guess I’ll go back to the drawing board again:). Thanks for making it, yet again, actionable. Although I have to agree with Kerilynn too, it is so much easier to do it for someone else. Ha! Well, we are keeping you on your toes eh? ha…Updating your author bio is important if you really want it to shine! I agree, it is easier to write for someone else. Writing about yourself is hard, isn’t it! I find it easier once I see a couple author bios to do my own. Good luck! I have a long way to go, but I am working on guest posting now, on a lot of different websites. I could probably always improve my author bio, but I do include the literary names of my dog and cat, to let people reading know just how serious about literature and writing I am. Adding a personal touch like the name of your animals is a great way to add a memorable touch to your bio! It’ll make you stand out for sure. With my author bio, I always change it according to the site it will be on. I also make it a point to audit my bio and see if it’s really working for me. Hi Elna. Do you audit your bio by looking at your analytics? Best to you. Every few months I do audit my bio and take a look to see if I need to change it. If I land more clients or change my opt-in or services, I make sure to update my bio to reflect that. It’s something all freelance writers should do periodically. I love Kerylynn Engel’s website and bio too!! She was among the first freelance writers I came across when I was looking at different writers websites online. I’m about to send my first guest post, hopefully it will be accepted. They asked for a 100w bio and it’s the first time I have to write one. I learnt a lot and although I’m sure my author bio attempt won’t be ideal, it will definitely be much better now that I read your post. That’s awesome! I hope your author bio converts!